How bad will the Gulf of Mexico oil spill turn out to be - for wildlife and for people whose jobs depend on wildlife, such as fishermen? At the moment, the only completely accurate answer would appear to be: we do not know. For David Kennedy from the US National Ocean Service, it is "a very very significant event, and of great concern". But Clifford Jones, an oil and gas engineering specialist from the UK's Aberdeen University, suggests it should not be considered in the same category as the Exxon Valdez spill of 1989, with which it is regularly being compared. It is a threat to the ecosystem, he allows, but says the Exxon Valdez leaked significantly more oil than is likely to flow from the stricken Deepwater Horizons drillsite before pressure in the well drops and stops forcing the oil out. There is no doubt that the oil is coming out much more slowly than is normal from a tanker spill. In principle, this allows the authorities greater time to deal with it - although clearly in this case their efforts have met with mixed success. Oil breaks down naturally in seawater, and in the warm Gulf of Mexico water, this would proceed much faster than in Alaska's Prince William Sound, where the Exxon Valdez ran aground. In oil spills, as in medicine, prevention is always better than cure. And the first priority for authorities in Louisiana and elsewhere along the Gulf coast is to stop oil washing up on shore. Booms are being deployed, dispersants sprayed, and some patches of oil are being burned. The Louisiana Coastal Protection and Restoration Authority is increasing the flow of water through two inland water channels in an attempt to wash oil-tainted seawater out of ecologically important wetlands. "Home not only to a thriving fishing industry but also a substantial nature reserve, the potential for damage is enormous," says Simon Coxall from the UK's National Oceanography Centre in Southampton. "Booming the area off with floating dams to protect these areas is the best option; but the size of the spill will exhaust the world's supply of oil booms very quickly." What makes this region ecologically special is the unusual patterns of land and sea conjured into existence by the lazy and variegated exit of the mighty Mississippi into the Gulf. Here lie about 25% of US wetlands - areas rich with life, where human occupancy is low, and birds and other animals can thrive. "For birds, the timing could not be worse; they are breeding, nesting and especially vulnerable in many of the places where the oil could come ashore," warns Melanie Driscoll, a Louisiana-based bird conservation director with the National Audubon Society, the leading US bird conservation group. "We have to hope for the best, but prepare for the worst, including a true catastrophe for birds." The society's list of species potentially affected includes resident seabirds, waders and waterfowl, including heron, brown pelicans and oystercatchers, and migratory birds such as plovers, swallows and buntings that use the Gulf wetlands as a stopover. The society points out that for some species, this is the now only home they have, with human development further inland having fenced them into these extremities. The oil slick changes shape and direction rapidly, so predicting where it will make landfall and with what frequency is a hazardous business. Clearly, the longer it takes BP to stem the flow, the greater the chance that its impacts will be felt further around the shores of the Gulf of Mexico, and indeed in its open water. "If you've got seagrass beds badly contaminated, clearly the manatees could be seriously affected," says Carl-Gustaf Lundin, head of the Marine Programme at the International Union for the Conservation of Nature (IUCN). Here again is a species that is already under severe stress. Fewer than 2,500 adults remain, and the IUCN Red List says the Florida subspecies is expected to decline by at least 20% over the next 40 years, with various factors implicated, including climate change and impacts from boats. The Gulf waters are already affected annually by fertilisers washing down from southern US farmlands, resulting in a "dead zone" where algae have consumed most of the dissolved oxygen and nothing else can grow. The Atlantic bluefin tuna is another possible victim. Over the next six weeks, the western population of this heavily depleted species will spawn in the Gulf of Mexico - principally in the northern portion where the slick is growing. "The oil would have an impact - it might be toxic to eggs or to the young fry," says Dr Lundin. "Also, the young hide in sargassum (floating marine plants) - they're very vulnerable at this stage - and this could also be affected by oil." Each of these possible impacts on wildlife translates into human consequences. For tuna and shrimp, you can read jobs in the fishing industry and food supplies for US consumers. 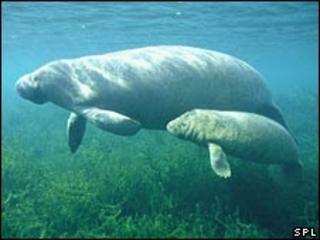 For birds and manatees, you can read tourist income. No two oil spills are alike; and given the vagaries of winds and sea currents, predicting the likely impact of this one is very difficult. But you can see why local authorities and conservation groups are beginning to be seriously concerned.